A novel naphthalene based fluorescence probe NBDH was designed and synthesized. Probe NBDH exhibited highly selective and sensitive responses towards Al3+ in HEPES-NaOH buffer solution (pH = 7.4). 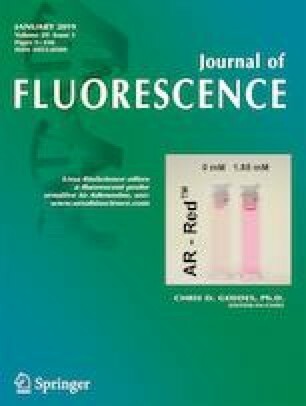 In addition, the detection of NBDH to Al3+ could be achieved through dual channels embodied in significant fluorescent turn-on signal and ratiometric absorbance response. The stoichiometry ratio of NBDH-Al3+ was 1:1 by fluorescence job’ plot and binging mechanism was further varified by the FT-IR, NMR titration and HRMS. Furthermore, NBDH was achieved in real sample detection, and a series of color test paper were developed for visual detecting Al3+ ions. The online version of this article ( https://doi.org/10.1007/s10895-019-02374-4) contains supplementary material, which is available to authorized users. This work was supported by by the Research Science Foundation in Technology Innovation of Harbin (No. 2017RAQXJ022) and Postdoctoral Scientific Research Developmental Fund of Heilongjiang Province (No. LBH-Q14023).